MiFID II/MiFIR compliance is one more reason firms should review their internal technology architecture, especially around data governance and reporting support. London, 10 August 2016 – The sequel to 2007’s Markets in Financial Instruments Directive is set for implementation in January 2018, and its scale and scope should not be underestimated. Both MiFID II and the Markets in Financial Instruments Regulation extend the scope of requirements from equities and equity-like instruments to nearly every other asset class under the sun. What can buy-side and sell-side firms do to prepare for the practical and operational challenges they are likely to face due to these incoming requirements? 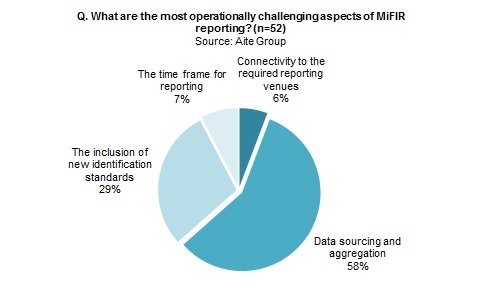 This report highlights some of MiFID II and MiFIR’s key impacts for Aite Group clients operating in the European markets. It is based on conversations with market participants at capital markets firms and regulators active in Europe, and a poll of 95 attendees of an Aite Group webinar in June 2016. This 45-page Impact Note contains 15 figures. Clients of Aite Group’s Institutional Securities & Investments service can download this report.